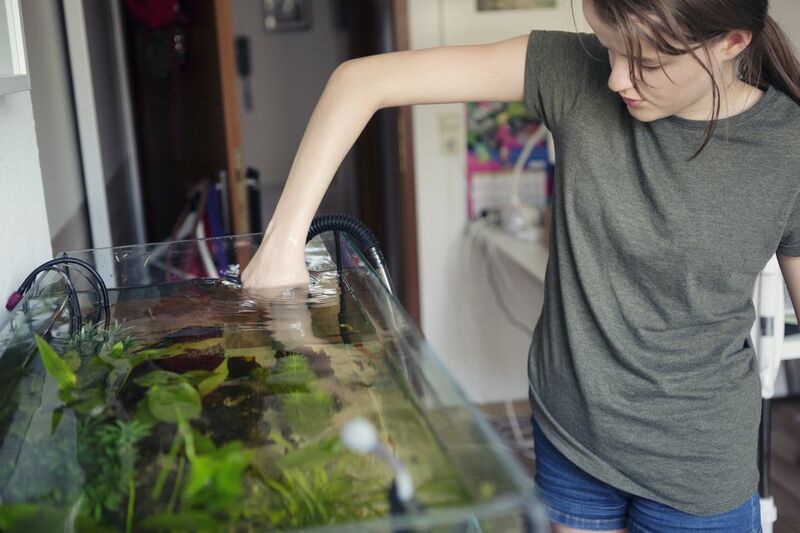 The Pinpoint pH Monitor continuously measures aquarium pH to within 1/100th of a unit. This precision pH monitor immediately detects changes in aquarium pH. Powered by a 9V battery (not included) the "LOBAT" indicator signals for a replacement. It has a large, easy-to-read display and a lab-grade epoxy electrode features a BNC connector. 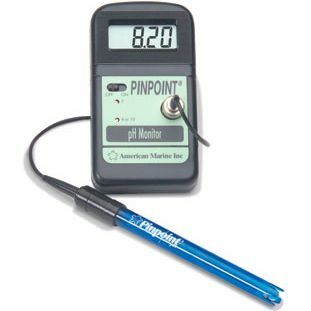 The Pinpoint pH Monitor comes complete with probe and calibration fluids. Measures 3" x 5". For salt or fresh water use. The Smart Lux Light Meter in an economically priced light meter which accurately measures light intensity in aquariums. This easy-to-use portable lux meter helps optimize aquarium lighting. This easy-to-use, portable lux meter with waterproof sensor gives a precise reading of how much light your aquarium inhabitants actually receive. Accurately measures from 0.000 to 50,000 Lux with ±6% of reading ±1 digit. The required 9V Alkaline Battery is included. Measures 3" x 1-3/8" x 5-1/2" high. The America Marine Pinpoint Calcium Monitor is an asy-to-use portable digital calcium monitor with a precise LCD readout which displays calcium levels in ppm. Just dip the calibrated probe in water sample for quick and accurate measurement. This monitor is powered by a standard 9-volt battery (not included). It has a display Range of 000.0 – 9,772.0 ppm Ca+, with an accuracy +/- 2% after calibration. The monitor measures 3" x 5" and includes calcium meter, calcium probe (7" probe with 10 ft probe cable with BNC connector) and calibration fluids. The American Marine Pinpoint Nitrate Monitor is a digital nitrate monitor which measures nitrate in a range of 0-10 ppm for reef use, 10-100 ppm for fish-only marine system. This dual range nitrate monitor is accurate to ± 1 ppm after calibration. Accuracy for either scale is ± 1 ppm after calibration. Resolution for either scale is 1 ppm NO3. Includes probe, display unit and probe protector. Runs on 9V battery, which is not included. The unit measures 3" x 5". Use with Nitrate Electrode Calibration Solution, sold separately. The American Marine Pinpoint Salinity Monitor accurately and immediately measures aquarium salt levels in millisiemens (mS), but includes a chart to cross-reference both specific gravity (S.G.) or ‰ salt (ppt). The reading is fully temperature compensated for true readings of salt levels. Includes a 53.0 mS reference/calibration fluid. It runs on a 9V battery which is not included. The American Marine Pinpoint Oxygen Monitor accurately measures dissolved oxygen levels from 0 - 20 ppm. The Pinpoint II Oxygen Monitor displays a digital readout for dissolved oxygen in either % oxygen or ppm saturation. This affordable and accurate dissolved oxygen monitoring system is the preferred monitor in the aquaculture industry. Includes probe with 5 ft cord, extra replacement membranes and probe electrolyte. No calibration fluids are needed. Operates for about 150 hrs. on a 9V battery which is not included. The American Marine Pinpoint Conductivity Monitor accurately measure freshwater impurities. Anything that is not water (like calcium, silica, magnesium, nitrate, etc. ), regardless of the amount, will be measured. The Pinpoint Conductivity Monitor is automatically temperature-compensated and has two ranges, making it useful for different applications (top off water?). This unit measures in microsiemens (µS) but includes conversion formula for other scales of hardness. It runs on a 9V battery which is not included. The American Marine Pinpoint ORP Monitor is a professional quality which monitor which constantly measures aquarium oxidation-reduction potential (ORP/REDOX). An essential aquarium-monitoring device for reef aquarium and other high-tech aquariums that utilizes ozone or ozonizers to break down organic waste materials. The large Liquid Crystal Display displays a 1 mV resolution with a ±1 mV accuracy (-2000 to +2000 mV range) and features a low battery indicator. Built-in offset screw for quick and easy calibration. The lab-grade, Ag-AgCl, epoxy electrode has full platinum band and BNC connector. It runs on a 9V battery which is not included. The Pinpoint ORP Monitor is fully guaranteed and measures 3" x 5".